My dad recently forwarded me this awesome ABC News video talking about the "Ditch Dog." It's a hot dog covered in good ol' mac and cheese. Since it's Fourth of July weekend coming up, I figured it'd be fun to do a themed Mac of the Day post. 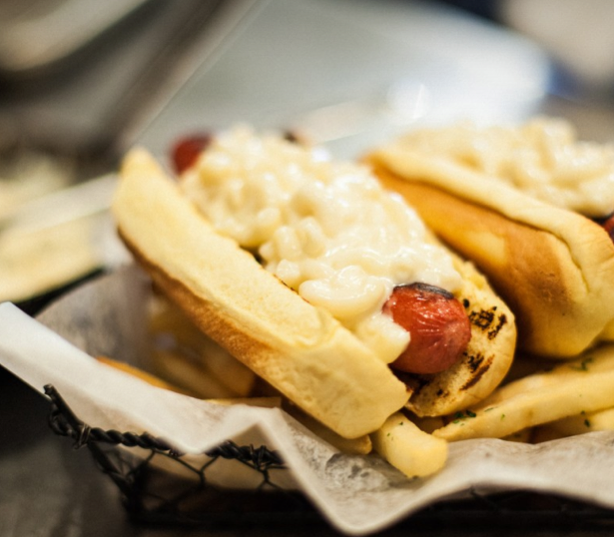 The Ditch Dog is the creation of the culinary experimenters at Ditch Plains, a New York City oyster bar and fish shack that also serves up this awesome concoction of hot dog and macaroni. According to executive chef Marc Murphy, this mac uses Parmesan, Gruyere and white American cheeses. I'm normally a little averse to mixing macaroni and cheese with other comfort food favorites (burgers, pizza, etc. ), but I think I'd be interested in trying this sometime. Maybe it'll be one of my experiments! Below is the ABC News interview and demo with Ditch Plains executive chef, Marc Murphy.